Civil Works - City of Regina Ductbank - 13th Avenue Contract #1 - Robert B. Somerville Co. Limited. 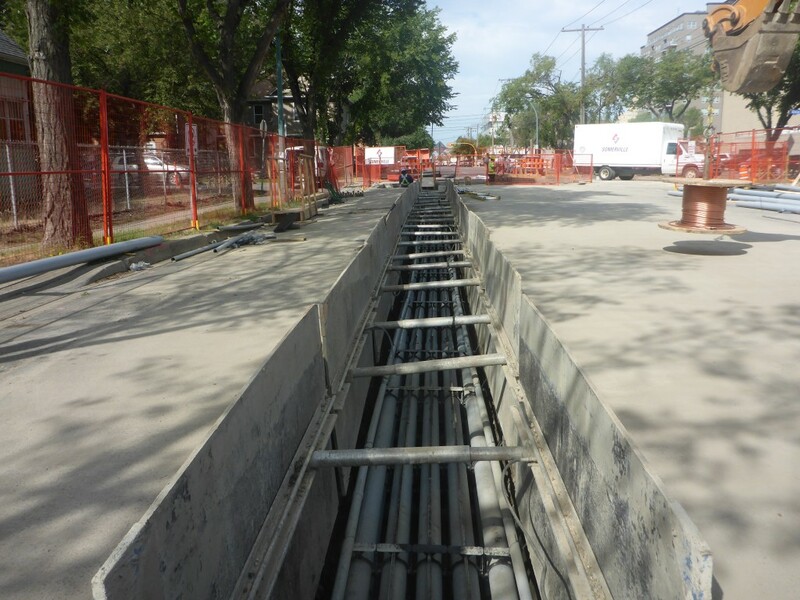 As part of a City of Regina revitalization project and other customer connect projects, Robert B. Somerville installed new SaskPower ductbanks & manholes to help facilitate the interconnection of the various substations and loads within the service area. For this project Somerville installed three pre-cast vaults along 13th Ave and connected them with 400m of concrete reinforced duct bank as well as connecting to two existing vaults. The ductbank consisted of 10 – 5″ conduits, 2 – 2″ conduits and grounding cable. The installation of two of the vaults involved working in extremely close proximity to an aged critical watermain which required extra care and protection. In addition, this project involved coordination with the City of Regina and one of it’s subcontractors to facilitate the relocation of city infrastructure in conflict with the proposed SaskPower ductbank. This work was also coordinated with the Regina Regional Hospital, in order to minimize impact to emergancy services & parking at the hospital.